Make a positive first impression, increase the efficiency of your front desk, and give guests a quality experience. Meet your guest's expectations and impress visitors with an easy-to-use check-in and visitor management system. Visitors can be added directly from Outlook and sent maps, directions, and the wifi password in advance. Staff will be automatically notified of their arrival. All check-ins are securely stored and archived in a GDPR compliant management portal. Security notification, name tag printing, and follow-up can all be automated, freeing up time to focus on your guests. Get off on the right foot, even before visitors arrive with pre-registration in Outlook or Office 365. AskCody will automatically send directions and information about the building. When guests arrive, they check in with an elegant touch screen experience or by the receptionist. The data from their Outlook contact record will autofill the necessary forms; eliminating the need to hand over a driver’s license and negotiate correct spelling. Guest badges are automatically printed and WiFi access for visitors can be sent by email or SMS. Welcome+ is an intuitive, modern and professional visitor management solution from AskCody that improves the front desk processes and visitor experiences. Automated check-in flows, badge printing, NDA-signing and notification capabilities. All fully GDPR compliant and in compliance with ISO 27002 on Information Security. The front desk always has a full overview of all guests in the building at any given time, including unexpected guests, with the seamless integration to Outlook and Office 365. This is the best solution for updating an existing paper-based visitor management process. AskCody generated daily reports that can be printed and distributed to current stakeholders while leveling up the technology on the back end. This enables you to support a current gen workflow with next-gen visitor management automation and workplace analytics. For example, when a visitor arrives they can check in on a tablet; they will be presented with any relevant forms to sign, like NDAs, and notifies the person they are visiting of the guest’s arrival. Meeting hosts and contacts are automatically notified upon guest arrivals via email or SMS. You can easily manage all contacts and users with the Welcome+ Receptionist tool or seamlessly integrate with Microsoft Active Directory and Azure Active Directory. AskCody Visitor Management system automatically sends email and SMS notifications to the host upon visitor check-in to ensure hosts are always aware of visitor location and visitors are never left waiting. This eliminates the need for a receptionist to track visitors down. Once a visitor checks in, Welcome+ automatically prints personal visitor badges, creating a streamlined and efficient visitor management experience for your team and front desk staff. Add your visitors’ appointment details to their badges or the meeting host information. Include their meeting room, your Wi-Fi code, or other. This way, your visitors have all the information they need before their meeting even starts. Welcome+ guest registration enables automatic handling of guest pass printouts and host-notifications together with Outlook and Office 365. From the familiar Outlook interface in both Outlook and Office 365, you can easily add guests to your meetings to the virtual guest list and at this moment provide the receptionist with an overview of the expected guests for the day. This makes it easy to check-in upon arrival and notifies the host of the meeting, as well as provide the receptionists with the right information to guide the guest to the right room. Users can easily add meeting guests to the virtual guest list and instantly provide administrative staff with an overview of expected guests for the day, all from the familiar interface within Outlook and Outlook 365. This makes it easy to check-in upon arrival. Reminders and notifications can be modified by each meeting host to make a personal experience. With Welcome+ your company registers its visitors in a secure, easy and professional manner that tracks visitors and which employee is hosting them. Each visit is logged which means that a full history of all visitors and which employee that hosted him/her can be viewed at any time. This increases company security by providing the front desk with a full overview of which guests are in the building at any given time. With Welcome+ your company registers its visitors in a secure, easy and professional manner that tracks visitors and which employee is hosting them. Each visit is logged which means that a full history of all visitors and which employee that hosted him/her can be viewed at any time. Welcome+ always logs guests to provide an easy overview for administrators. 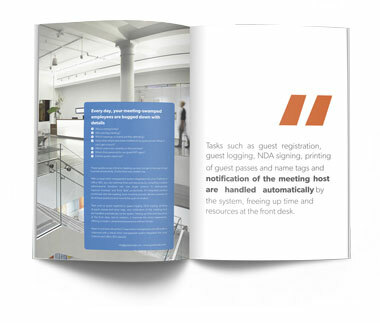 For the security of the company, it is important that the reception always has a full overview of which guests are in the building at any given time. Evacuation reports can be compiled and printed out at any time. What if you could have one solution for digital wayfinding, visitor management, employee notification and cloud-based management in one single, seamless solution, providing your visitors with detailed directions in a rich and engaging format? AskCody WayFinder can be combined with Welcome+ to provide one single touch screen solution and is configured depending on the services implemented on site and the specific purpose and need for a particular location. What languages do AskCody support? The AskCody Workplace Platform is available in major languages of your choice. Optimizing front desk resources makes happier staff and more satisfied visitors. Download the eBook and learn how to optimize a visitor management system and thereby free up time int he reception.